Shore Acres is a luxury lakefront pool house with 6 bedrooms located in Union Pier, MI. Property Size 6,150 sq. ft. Welcome to Shore Acres, a luxury lake front vacation rental available exclusively through Yellow Bird Vacations. Set on Lake Michigan's spectacular sunset coastline in Union Pier, this fantastic property is one of the finest examples of luxury accommodations and amenities that you can find in Harbor Country. Shore Acres is a lakefront country estate style getaway comprised of a beautiful six bedroom main house, an adjacent two bedroom guest house and a beach-side cabana that sit on a large, grassy yard overlooking the pool and Lake Michigan. A sandy beach is easily accessed via a well-maintained stairway. The gated entry to the property opens to the driveway with plenty of parking between the house and guest house. The first floor of the main house features a great room style eat-in kitchen and family room that look out to the pool and lake. The first guest bedroom with a queen bed and lake/pool view, two full bathrooms, a formal dining room and a living room are also on this level. The lower level is nicely finished and it has two entertainment spots - one for lounging in front of the fireplace and watching the 50" television and another with a fun gaming table with comfortable seating for eight. There is also a kitchenette and a full bathroom in this lower level. 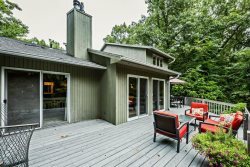 All five bedrooms on the upper level of the house, including the Master Bedroom Suite with a king bed and a bath at the southwestern corner of the house that both have lake views. The third bedroom is at the north end of the hall and has a queen bed and sweeping lake views. The other three bedrooms (numbers four, five and six to help you keep count) have queen beds and look out from the front of the house. One of the three guest bedrooms has an en suite bathroom, and there is a third bathroom in the hall to serve the other two bedrooms. The guest house is a lovely spot located just a few steps from the main house. The first floor has a large eat-in kitchenette that is perfect for breakfast, along with a full-sized Viking Refrigerator, dishwasher, microwave and coffee pot. Just north of the kitchen is a sunlight filled living room with beautiful views of the yard, pool and lake, a perfect spot for quiet relaxation and reading. The two bedrooms are upstairs, both with queen beds, and this level also has a full shared bathroom and a family room with a television. The family room opens to a patio deck with spectacular lake views. The professionally landscaped grounds are green and lush and include a heated in-ground private swimming pool, an in-ground eight-person hot tub and a cascading water wall effect. Additional outdoor amenities include an outdoor wood burning fireplace located at the Beach-side Cabana and an extra-large outdoor shower at the side of the Guest House. As mentioned, you can also walk down the stairs and spend the day on a great Lake Michigan beach. Shore Acres is truly a unique property and one of the finest appointed and located houses in our very competitive market. It’s great for a repeat visit every summer or for making once-in-a-lifetime memories with your family. Summer rentals are available with a seven night minimum and non-summer rentals are available with a five night minimum. Please note that we are not allowed to host large parties or weddings for various logistical reasons.